As of this writing we are in the third day of a government shutdown. A lot of the conservative crowds are happy and proud. Most on the democratic side, such as myself, are concerned and frustrated. Each side throws out its rhetoric. The words they use are pretty much the same, with talk of the good of the country and the good of the people. Yet the intent between the sides is radically different. Of course I see this only from my own perspective. As hard as I might try, I find it difficult to make sense of the opposing opinions. There is a disconnection in the opposite view that I cannot piece together in any fashion. I will grant that the conservative party believes they are doing the right thing, but I wonder if they recognize the contradiction that exists between their words and their actions. They say they love the country and they fight the good fight. At the same time, they contrive to shut the government down. The cries of “cut it or shut it” began a few years ago, with talk of shrinking government so small it could be drowned. I will concede that the democratic party as well as the conservative party arranged some short lived shutdowns in the past, interestingly enough over the deficit during the Regan administration. 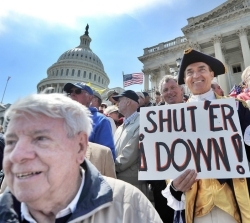 But this is the first time in long memory that a group proudly proclaimed that the government is the problem, called for a shutdown before an election, and having been elected carried out a shutdown. This is a matter of forethought and desire, not happenstance. What is a country if it isn’t its government? What makes the United States great, if it still holds any greatness? Is it the land itself? I was taught it is our government and its unique set of laws and structures. When I hear conservatives talk of shutting down the government in the name of American greatness, I have the image of an individual holding a puppy and saying, “I love my puppy. Let’s kill it.” It is a cognitive dissonance I cannot wrap my mind around. I will accept that they are unhappy with some laws or structures. Both sides are. That is what government is, an attempt to build a balance. Without government, there is no moderator. The rich and strong win everything, and the meek and weak lose. The structures of government provide avenues to create, modify, and remove laws with an agreement of the majority. It does not always work at the outset, but given time and effort if it is the will of the people things can be changed. Without government, brute force becomes the law but does not necessarily represent the majority. Likewise there are times when the minority requires a protector. Without a government what is America other than a portion of the North American continent and a mass of people without common goals? How can you both love your darling country and wish to kill it in the same thought? This entry was posted in Journal, Oh no. Politics and tagged Politics. Bookmark the permalink.